With Mother's Day just behind us, and Memorial Day and Graduations just ahead, there is no dearth of occasions for email marketers to promote right now. This email from Snapfish is the first sighting for The Retail Email Blog for Father's Day promotions this season. This email from LOFT is a nice example of a "Do" for subject line personalization. It leads with the subscriber's name, and is further enticing with the ellipsis. Another nice touch is the segmentation of the locale dynamically populated in the pre-banner. And here is the "Don't"... This subject line from Home Depot is personalized by the subscriber's preferred store location. Unfortunately, it reads a bit awkwardly, as if the store location is a salutation or form of address. I would recommend rewording the subject line to clarify that Colma is the store location being featured, such as You Don't Want to Miss This Week's Ad for Our Colma Store. 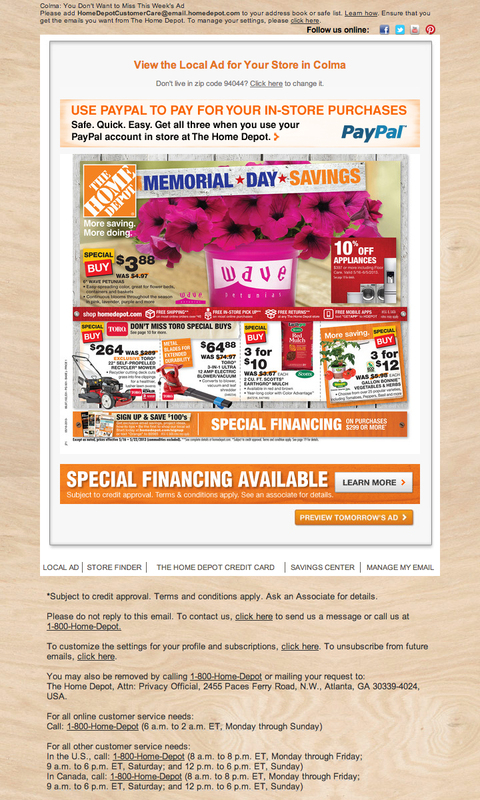 On a positive note, I applaud Home Depot for their delivery of a weekly flier via email (thinks of the trees saved!). 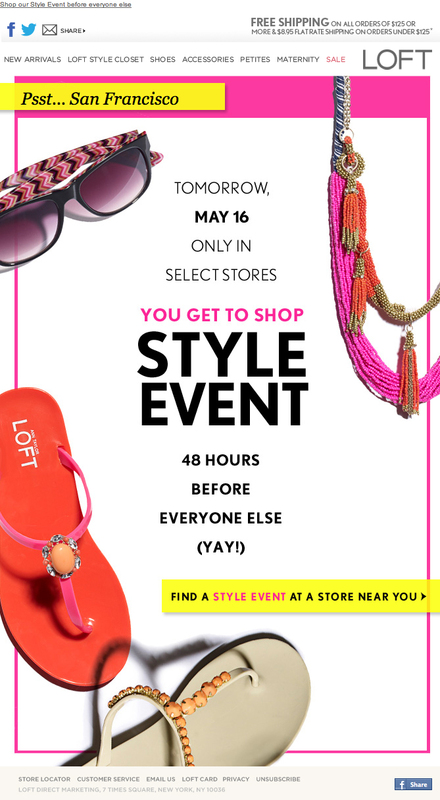 The main body of the email shows a scaled down covered shot of the flyer, which has text too small to read, but clicking on the call-to-action takes the viewer to an online version of the flyer, which is nicely proportioned, and easy to read. Crate and Barrel, 5/16 -- We love this table + Free furniture delivery. Anthropologie, 5/16 -- Traveling? Take note. Petco, 5/16 -- Final day to save 20% sitewide! CB2, 5/16 -- up to 50% off planters. contain your excitement. 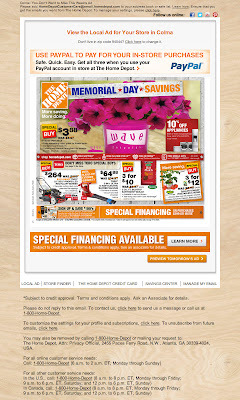 The Home Depot, 5/16 -- Psst, Memorial Day Savings Start Today! Walmart, 5/16 -- ☼ Pools from $99.97? Get OUT for family summer fun. TOMS, 5/16 -- Exclusive summer plaids: get checked out! The Children's Place, 5/15 -- Don't Miss Out! 30% Off Everything Ends Tonight! The Crutchfield Team, 5/15 -- Our best gear. Our best prices.